A recent Historical Walking Tour. 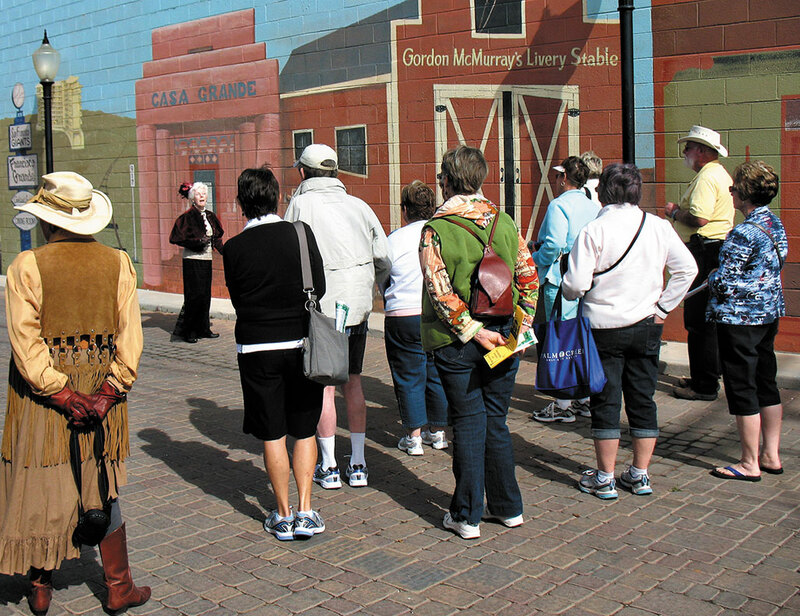 Join us for “Day Out Downtown” in Casa Grande’s Historic District on Tuesday, October 21. Back by popular demand, this event moves to the third Tuesday mornings from 9:30 a.m. to 2:00 p.m. to encompass more aspects of what makes our town’s story so unique. The Historical Walking Tour will start at the Main Street Patio at 10:00 a.m. and last approximately one hour. Costumed characters will transport you back in time to a town once named Terminus because it was the end of the railroad line. Stories of the pioneering spirits that won the West will keep you asking for more. In addition to the tour, the weekly outdoor market will be buzzing at the corner of 4th and Florence Street. In the works are plans for cooking, gardening and crafting demonstrations by local talent and community groups. Should you be interested in having your group or talents showcased at Day Out Downtown, please contact me at 520-836-8744 or downtown@cgmailbox.com for more information. You can find all the latest information for ongoing events and more by checking out our website at www.cgmainstreet.org. Click on our Facebook link to stay connected and “like” our page for impromptu announcements.